The following article is reproduced from the January-February 1998 edition of American Breweriana Journal by permission of the author, Ed Sipos. The article is excerpted from Ed's upcoming book on the complete history of brewing in Arizona. The excerpt represents only a small portion of Ed's manuscript. To contact Ed, e-mail him at azcan@hotmail.com or call him at 602-945-0655 (day) or 602-947-2348 (evening). The repeal of Prohibition in 1933 gave birth to scores of new breweries throughout the United States. Eight brewing companies would attempt to open in Arizona after Repeal. Only one, the Arizona Brewing Company, would be successful. From humble beginnings of only 15,000 barrels per year, The Arizona Brewing Company would grow to produce over 250,000 barrels annually. During the brewery's heyday in the 1940s and 50s, its flagship brand, A-1, would become the largest selling beer in Arizona. The Arizona Brewing Company was founded as a closed corporation on May 6, 1933 by two brothers, Martin and Herman Fenster. Their brewery would be at 1143-1153 E. Madison Street in Phoenix, Arizona, with 34,000 square feet of floor space, and feature copper products in its equipment. All cooling rooms, storage rooms, fermentation rooms, and any other sections where the beer was kept, would remain under lock and key. Cleanliness would be an important aspect of the brewery. The population of Phoenix by 1933 was just over 50,000 people, and it was the largest urban area between El Paso and Los Angeles. It was also the leading retail and wholesale trade center in much of the southwest. Many people, including local farmers and miners, depended on Phoenix for the necessities of daily life. The Fenster brothers picked an ideal location for their new brewery. The brewery's first ad appeared in the Phoenix Gazette on August 3, 1933, announcing "A Toast to Arizona from a New Industry." It advertised the plant as a "New Deal" brewery, reflecting F.D.R. 's program to counteract the depression. It represented a $125,000 investment with an initial capacity of 30,000 barrels per year. The brewery would have 15 employees at the start of operations in 1933. Martin was the first president and general manager, and Herman served as president and sales manager. Both brothers had worked in breweries before. Herman was with the Cleveland and Sandusky Brewing Company in Ohio for eight years and later was assistant sales manager of the Los Angeles Brewing Company. The brothers wanted to produce a superior product. Samples of Phoenix water were sent to Chicago, Pittsburgh, New York, Germany, and Hungary for testing. Without exception, the chemists who tested the water stated that it surpassed the standards for making beer. Yet, no matter how good your water is, a beer will not pass a taste test without an experienced brewmaster. Oskar Scholz was picked for the job. Oskar studied for many years at the brewery school in Prague, Czechoslovakia, and also at the brewing academy in Vienna. He supervised the establishment of three modern breweries in Austria, and he was once brewmaster at the world famous Pilsen Brewery in Pilsen, Czechoslovakia. He came to Arizona with 24 years of brewing experience. The first batch of beer from the new brewery was to be ready on October 14, 1933. However, things would not be so simple. A delay in the arrival of barrels made the beer two days late. The beer would simply be Arizona Brew beer, a lager type, available only on draught. The alcohol content was a perfect 3.2 percent by weight. A blend of imported domestic malt and hops was used in making the beer in accordance to the brewmaster's special formula. The next step in the brewery's growth was the addition of a bottling line. The company would also need a name for their new product, so a contest was announced in the Arizona Republic. Prizes included $50 cash for the best name selected and fifty additional prizes of one case of beer each to all contestants who submitted a name that received honorable mention. Over 10,000 names were submitted and the winner was Sunbru. Sunbru would be the first Arizona beer sold in bottles since the end of Prohibition. However, the Sunbru brand would be short lived. Soon after the new bottled beer was unveiled, negotiations for the brewery's purchase was underway. Justification for the sale of the Arizona Brewing Company is unclear. There could have been a number of reasons, including the fact that the start of any brewery took a lot of money, time, and effort. Then again, the right offer could have been made! The buyers included E.P. Baker, then vice president and general manager of the Aztec Brewing Company of San Diego. Baker stressed that the brewery's purchase was in no way a purchase by the Aztec Brewing Company, but a personal venture on the part of himself and his associates. The buyers had to consider the cost of rebuilding the present plant and gaining the cooperation of the creditors for the deal to be completed. On April 11,1934, the purchase of the brewery was announced, along with plans for improvements in excess of $100,000. The brewery's capacity would increase by at least four times. New equipment including bottling apparatus and more employees would be added. The new owners would continue under the name of Arizona Brewing Company. George Bines replaced Scholz as brewmaster. Scholz moved to become brewmaster of the Harry Mitchell Brewing Company in El Paso, Texas. Work started immediately. A one-story addition just west of the original structure added 12,000 square feet of plant space. By July 1, daily production required increased storage capacity by 150 barrels. Ten fermentation tanks with a capacity of 50 barrels each were installed and a new labeling and pasteurizing machine was purchased. Only union labor was used at the brewery. Russell stressed that local merchants would be patronized to the greatest extent possible. Employee numbers would total 45 to 50 persons by the time the brewery's expansion was completed. On June 3, 1934, a completely new beer was introduced. Apache Beer would replace Sunbru and Arizona Brew as the company's main brands. Initially, Apache was available only on draught. Bottled Apache Beer was available around August 25. The first advertisement for Apache Beer in a bottle appeared in the Arizona Republic in September. The company increased its advertising budget as the popularity of their new beer increased. Many locals began to call the brewery the "Apache Brewing Company" instead of Arizona. At first, the beer was offered only in the Salt River Valley and its immediate vicinity. Soon Apache was sold throughout Arizona. By 1935, its distribution extended to all of Arizona, New Mexico, and parts of Texas. With the increase in sales, the Arizona Brewing Company was able to add a new bottling and canning line. By the end of 1935, Arizona Brewing was one of some 36 breweries putting beer in cans. The first ads selling Apache Beer in cans appeared in the July 24, 1936, edition of the Arizona Republic. The Arizona Brewing Company gained the reputation as being one of the most modern breweries in the nation. By January of 1937, investment in the brewery represented more than $357,000. The company's payroll exceeded $1,000,000. B.J. Russell, general manager of the brewery, was eager to keep the plant up to date. In early 1937, he made a special trip to St. Louis, Milwaukee, and Chicago to study new methods and look at new equipment. He was set on bringing any new improvements in the industry to Arizona. During this time, the brewery was seen as one of the fastest growing and newest major industrial activities in Arizona. An interesting turn of events took place in June 1937. Russell decided to retire, possibly due to poor health. Consequently, he and Wirt G. Bowman, one of the original investors, decided to sell their controlling interests. The sale of the brewery was apparently not a part of the plan, until a Los Angeles businessman, Robert H. Elder, stepped into the picture. Needless to say, the decision to sell the company was made and the rest is history. For the third time in four years, the brewery would be sold. Robert, or Bob as many referred to him, saw an opportunity for growth in the company. He was an experienced business executive and president of one of the largest distributing companies for liquor, wines, and beer in California. His new venture would make him president and principle stock holder of the Arizona Brewing Company. George Bines would be replaced by Erhardt W. Lindner as brewmaster of the brewery. Robert Elder's decision to hire Lindner was a good one. Lindner was born in Bavaria, Germany, in 1877. As a youth, he worked in many small breweries and later graduated with honors from the brewing school in Munich. He served as head brewmaster at several of Europe's largest breweries. His move to the United States in 1905 would associate him with the Star Brewing Company and Griesedieck Western Brewing Company in Belleville, Illinois, and later the Standard Brewing Company in New Orleans, Louisiana. When prohibition was imminent, he moved his family back to St. Louis and left the industry for a number of years. His interest in brewing would later find him enrolled in the Wahl-Henius Institute of Fermentology, considered one of the finest technical brewing schools in the world. Just prior to his move to Phoenix in February 1937, he was head brewmaster of the Peerless Brewing Company in Washington, Missouri. Over the years, Mr. Lindner would become known as "Pop," "Pappy," or "Dad" Lindner. He had three sons and one daughter born in Belleville, Illinois. Two of them, Herb and Max, would follow in his footsteps and carry on the brewing tradition of the family and ultimately come to Phoenix to work with their father. Robert Elder and the Lindners brought many new changes to the Arizona Brewing Company. In addition to new technology, a laboratory for conducting chemical tests was added. Since Elder had achieved success in the beverage distribution business, he decided to set up a wholesale whiskey warehouse on the premises of the brewery. This would enable the simultaneous delivery of beer, alcohol, whiskey, and wine from the premises. Phoenix was a fairly small city during this time, yet it was growing at a steady pace. The Salt River Valley was considered one of the richest agricultural areas in the world. However, the depression still plagued many areas. Some tavern owners would have to get cash to pay for the products before placing their order. Many times they would call in on a late Saturday night ordering whiskey, wine, or beer to be delivered from the brewery. Sure enough, the order would be delivered. It was just a way to help the tavern owner carry over until Monday morning. However, no large shipments were ever delivered until regular working hours. Shortly after taking over, Elder did away with the canning line. The exact reason for this is unknown, but it is possible that the sale of canned beer was just too low. Then again, the move to eliminate canning may have simply been a cost cutting effort. For whatever reason, possibly fewer than 265,000 cans of Apache Beer were ever filled and sold to the public. The Arizona Brewing Company would not introduce beer in cans again until 1948. Elder was the youngest brewery president in the United States. His youthfulness possibly helped him come up with some of his novel approaches in selling the brewery's beer. In September, 1938, brewery workers would deposit a nickel and leave a card on windows of parked cars stating, "Take your time... we deposited a nickel!" The card included an advertisement for Apache Beer. Consequently, each person knew who had saved them from a $2 parking ticket. In response, the brewery received hundreds of letters in appreciation and many even returned the nickel. The brewery would even pick up a few dealers from the stunt. The program proved a success, but lasted only a short while. It would be against the brewery's better judgment to have the public get too used to the idea. On May 25, 1938, a celebration was held at the Arizona Brewing Company to honor Elder's first year as president. Fourteen hundred people visited the plant including the state governor and the mayor of Phoenix. A lunch was provided and an orchestra entertained. Under Mr. Elder's helm, production of Apache Beer had increased by more than 30 percent and sales now extended into west Texas, New Mexico, and southern California. Tax figures showed that the products put out by the Arizona Brewing Company were outselling all others in the state. The celebration proved to be very successful. Parties hosted by the brewery would become annual affairs. In January of 1939, the Arizona Brewing Company introduced Elder Brau All Malt Beer to their product line. It was a completely new formula put together by E.W. Lindner and his son Herb. The beer was unmistakably named after Bob Elder himself. Elder Brau's debut on February 6, 1939, featured an interesting advertising gimmick. Each label included a perforated strip that could be torn away to reveal an odd fact or amusing anecdote, in addition to a "poker hand" for entertainment underneath the label. "Eldet Grams", as they were called, would be available for approximately one year. The gimmick was a successful way to get the public to notice their new product. By 1940, popularity of the brewery's beer was on the increase and a $100,000 investment to improve the existing facilities got under way. A new bottling house was built to replace the smaller one on the southeast corner of 12th Street and Madison. A large beer cellar was under the bottling house where temperature was controlled by state-of-the-art air conditioning, a necessity in the Arizona summer. When finished, it was large enough to store bottling equipment, as well as cases of beer waiting shipment. During this time, Elder announced the opening of a new distribution branch in Tucson. The branch would deliver beer and ale, including wines and liquors, to dealers in the southern part of the state, similar to the system set up in Phoenix. Furthermore, in order to increase production, Lindner was given the okay to purchase a complete brewhouse in Los Angeles from a brewery that had gone out of business. The purchase included a cereal cooker, mash tub, and an eighty-five barrel copper kettle. Other equipment was also purchased from the brewery in order to accommodate Arizona's rapidly expanding brew-house. Prosperity of the Arizona Brewing Company allowed it to increase its advertising budget. In March 1940, a radio show called "Dance Arizona" was launched to boost sales of Elder Bran. The weekly half-hour show played on six stations throughout Arizona. A leading dance band was featured each week, including Jimmy Dorsey, Ozzie Nelson, Will Osborn, and other celebrities. Elder Bran was featured as "Your Friend for Life!" in the program's commercials. The show would remain on the air throughout the year. Other radio programs such as "Elder Brau's World News Roundup" featured on Phoenix radio station KTAR would advertise the product. In September of 1940, J.A. Cavanaugh, former vice president and sales manager for Lombardi Wines of Los Angeles, became the new sales manager for the Arizona Brewing Company. Mr. Cavanaugh would continue to expand the firms advertising programs on radio and other media. By August 1941, the brewery discontinued its wholesale liquor and wine distribution business. The decision was said to be based on the greatly expanding sales of Elder Brau Beer. However, the probability of more serious problems may have been the true reason. Herb Lindner went into the Navy in 1941. His brother Max would take over the duties of assistant brewmaster and would remain in that position until Herb returned in 1945. It was around this time that more serious troubles in Mr. Elder's liquor distribution began to surface. In late 1941, Elder found himself in bankruptcy court. In an effort to finance the distribution of alcohol, he may have spread the brewery's resources too thin resulting in declining profits. As a result, Bob Elder lost control of the brewery through bankruptcy in 1941. The bankruptcy arrived at a crucial time. With the effects of World War II becoming more evident, shortages in supplies would force the brewery to begin cutting costs. Still, the brewery remained a large labor force in the state, in addition to being a user of local products and materials. The uncertainty at the brewery left many workers worried. After Elder's bankruptcy in November 1941, Ralph B. Feffer was appointed trustee of the Arizona Brewing Company. He was a prominent Phoenix businessman who worked hard to rescue the brewery from its financial troubles. Despite low working capital and a hard struggle through the winter months, the brewery succeeded in lowering production costs and increasing overall efficiency. By securing the best possible distributors in the state, the brewery was able to increase demand and put the firm on a paying basis. The plant reached 100 percent capacity, resulting in orders falling behind schedule. The quality of the beer also improved. All this was accomplished while the second world war was gaining strength. War-time shortages in transportation, supplies, and metals, would increasingly plague the brewery and delay delivery of the beer. In March 1942, Elder Brau was discontinued because of anti-German sentiment, and the popular brand would simply be called Arizona Apache Beer, "The Stately Brew". The brewery stressed that the contents of the beer remained the same, only the label was different. On July 24, 1942, Feffer submitted his resignation as trustee. He never intended to stay at the brewery permanently. His request for resignation was sent to the creditors for consideration on the August 8th. They asked Feffer to continue as trustee pending the qualification of a new trustee or final sale of the brewery, which he agreed to do. During this time, continued uncertainty about the future put worker's morale at an all-time low. Good news came on August 22, 1942. Joseph F. Lanser, a former Tacoma, Washington, brewery executive, bid approximately $140,000 to take control of the brewery. Feffer recommended that the creditors accept the offer. On September 12, final sale of the brewery was cleared by the Office of Price Administration. The sale was a welcome relief to the workers. Lanser was known in western brewing circles for his eight years as president and general manager of the Columbia Brewing Company, Inc. in Tacoma, Washington. Lanser's purchase of 51 percent of the company's stock gave him the controlling interest. Major restructuring of the plant was set to take place. Lanser became president, B.J. Russell, an original. investor in 1934, was vice president. E.W. Lindner continued as brewmaster. 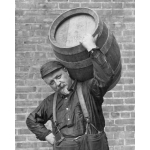 In 1942, brewery sales totaled 15,000 barrels. War time labor shortages forced the hiring of less qualified workers. Many had no prior brewery experience and quality suffered. This would change under Lanser. One of the most visible changes was the introduction of A-1 Beer in January 1943. All other brands were dropped with the exception of Dutch Treat, a private label for A. J. Bayless Markets. In addition, the brewery would now be known as the Arizona Brewing Company, Inc. Many locals would soon begin referring to the company as the "A-1 Brewery" in the same way they previously labeled the firm the "Apache Brewery". Around September 1943, government regulations and curtailed allotments of grain caused Arizona's malt quota to be completely shut off. Although there were considerable supplies on hand, the brewery did not want to use substandard ingredients, so brewing was temporarily halted until the situation could be remedied. In a short time, the brewery would be back to work while struggling to control the demands of war. The government gave the go-ahead to expand one of its buildings on 12th Street and Madison in 1944, and increased grain storage was added. The railroad tracks were also moved to the south side of the new addition to ease unloading of supplies. E.W. Lindner was in charge of brewing operations and Max Lindner oversaw the brewery cellars and the bottle shop. Despite the shortages of the war, the brewery still found ways to expand. By the end of 1944 sales reached 55,490 barrels. During 1945, buildings were added. One housed a cellar addition and the other a boiler room and grain storage. The cellar addition included fourteen brand new glass-lined tanks. As things improved the brewery increased its advertising budget. In 1945, a new ad campaign was run in conjunction with the Society of Regional Brewers. One ad placed in the August issue of Gourmet magazine featured Arizona as a "World Famous Vacation Land" while also pushing A-1 Beer. Its aim was to boost postwar travel to Arizona. The war would trigger an economic boom and population explosion in the Phoenix area. Several military installations were constructed in and around the surrounding valley including Thunderbird Field north of Glendale, Falcon Field near Mesa, Luke Field north of Litchfield Park, and Higley Field (which was renamed Williams Field) east of Chandler. Other military camps were built near Phoenix. The city became an oasis for dehydrated soldiers. Thousands would come to Phoenix, many brought their families, and many remained after the war to make Phoenix their permanent home. When the war finally ended, the Arizona Brewing Company was able to secure larger allocations of grain and materials. This would allowed work to start on a new plant. Herb Lindner returned from the service and went back to his position as assistant brewmaster to his father. Max Lindner became superintendent of the bottling house. The future of the brewery looked bright, but things wouldn't be quite so simple. By April 1946, the residual effects of the war still lingered. New government grain curtailments to reduce food shortages in Europe caused more problems for the brewery. The A-l brewery would be working on a thirty percent cut in grain. At the annual meeting of the Wholesale Beer and Liquor Association, Joe Lanser stated that the cuts would mean sixty percent less beer for Arizona drinkers, because brewers from outside the state would stop sending their shipments west. Arizona would suffer greatly due to its geographic location. Many had believed the end of the war would bring an abundance of beer to meet increased demand. In reality, Arizona dealers would suffer more acutely from shortages than at any time during the war. In order to satisfy increased demand, the brewery had to make their original extracts using less materials while producing more product. However, relief was in sight. Joe Lanser discovered that the Schutz and Hilgers Jordan Brewery in Jordan, Minnesota, might be for sale. He made an offer and purchased the Jordan plant, including that brewery's grain allocation. The purchase brought a sigh of relief. Under the government's grain curtailment program, the Arizona Brewing Company might not have been able to continue operations. With the purchase of the Jordan Brewery, A-1 would receive all the salable beer remaining in their tanks. This beer was bottled with Jordan labels and shipped by rail to Arizona. It arrived in time for the Fourth of July celebrations and consumers were glad to buy a bottle of Jordan Beer, even though they were unfamiliar with the label. Lanser sold the Jordan plant in late 1946 to the Mankato Brewing Company of Mankato, Minnesota. During the grain curtailment, Lanser was forced to allocate sales to taverns on a pro-rated basis based on an average of their previous purchases. This did not make much profit, but it did create good public relations with tavern owners. This gesture would pay off handsomely in the future. In those days, Phoenix was still fairly small and loyalties were not easily forgotten. When someone made a kind gesture to your business, it would be remembered. When federal grain allocations ended, Phoenix experienced a post war boom like no other time. The brewery increased sales to 81,927 barrels by the end of 1946. More prosperity was in the works. A-1 Beer was becoming more popular than ever before. Major expansion of the brewery would be needed to keep up with demand. In 1947, a large tract of land north of the main plant was acquired and construction started on a new bottle shop, bottling cellar, employee lunch room, and main office facilities. This was the $1,000,000 first phase in the construction of the new brewery. By the end of 1947, the brewery would be nearly four times larger than it was in 1941. The second phase of the new plant started in early 1948. The new executive, general sales, and advertising offices were completed in late March. Also completed around that time was a new bottle shop, warehouse, shipping and receiving room, and government storage cellars. A new brewhouse, including storage and aging cellars, would be ready by June 1949. Even though the war put an end to beer in cans, their popularity was not forgotten. Consequently, the Arizona Brewing Company resumed canning beer on February 10, 1948. By early 1949, Herb Lindner was elected vice president of the Arizona Brewing Company. His office would be located in the newly constructed office building at the brewery. Max would replace Herb as brewmaster of the company. Lanser would remain senior president, while E.W. Lindner would continue as plant superintendent. With the completion of the first phase of the expansion program, the brewery was capable of handling up to 250,000 barrels of beer. A portion of the new brewhouse was set aside for a beer stube and dining facilities. These facilities would accommodate tours, civic groups visiting the new plant, and parties for special occasions. The Arizona Brewing Company was considered one of the cleanest and most modern breweries in the country. Incredibly, the brewery was able to show a higher percent increase in sales than any other brewery in the United States. From 1947 to 1949, breweries nationally experienced a decline in sales of 2.6 percent. The Arizona Brewing Company broke this trend with an astounding 32 percent sales increase over the previous year. Near the end of 1949, the company opened its doors to all those wanting to inspect the new facilities. A promotional campaign invited the public to stop by for a tour. Tours were offered from 10a.m. until 4p.m., Monday through Friday. During the first week of October, an open house for dealers, spectators, and friends of the firm celebrated the completion of the $2,000,000 expansion program. The plant now had over 1,500,000 cubic feet of space, not including the loading platforms, roads, and railroad spurs. The new brew kettle was capable of producing 9,300 gallons of beer every five hours. Aging and storage capacity in the 102 individual tanks, exceeded 765,000 gallons of beer. This would be equivalent to over 8,000,000 12-ounce bottles. The Arizona Brewing Company was in better shape than ever. The completion of the brewery could not have come at a better time. The introduction of television to the Phoenix market would soon help the brewery capitalize on their investment. As the boom continued, so did expansion of the brewery. Additional canning and bottling equipment was installed, and construction started on a new boiler room. Modernization on portions of the original building were also started. New storage cellars and installation of glass lined tanks with a capacity of 1162 barrels would be completed in 1953. In addition, the A-1 brewery leased the former Arizona Distributing Company building on Madison Street, east of the main plant, for additional warehouse and office facilities. Sales reached 185,000 barrels by 1952. By the early 1950s, the days of the regional brewer were beginning to wane. Differences between large and small breweries were becoming more evident. Since the repeal of prohibition, the trend in the brewing industry was to increase production while expanding markets. Merging of breweries to form larger plants or the creation of chain breweries were on a rapid increase. Large corporations such as Anheuser-Busch, Pabst, and Schlitz began to squeeze out the market for smaller regional brewers. A number of small breweries across the country would be forced to close. Between 1949 and 1958, over 185 breweries ceased operations or sold out to larger operations. Many simply were not able to keep up with the ever increasing costs associated with running their plants while trying to keep the prices competitive. The Arizona Brewing Company was no exception. A-1 was at the peak of its popularity and profits. It is unclear at what point profits began to decline, but evidence seems to point to around 1952. At that rime, A-1's profits began a slow, yet steady decline. Even though A-1 would remain a number one seller in Arizona for years to come, taxes and operating costs were eroding profits. To sell more beer, advertising would have to increase. The need to advertise, regardless of increasing costs, would prove detrimental to many breweries, including A-1. Furthermore, union employee and salaried employee payroll increases would add to A-1's expenses. Money to cover these expenses had to come from somewhere. Consequently, stockholder dividends declined considerably beginning in 1952, even though sales were at an all-time high. The early 1950s would he challenging years for the A-1 brewery. Many large breweries began to move west, primarily to California. In 1954, Anheuser-Busch opened a new $20,000,000 plant in Los Angeles. Theo. Hamm, Schlitz, Falstaff, and Pabst built or bought out smaller operations in California. Lower shipping costs for these brewers meant more competition for A-1 with more competitive pricing. However, one of the main culprits in the decline of A-1 was the advertising efforts by the Adolph Coors Brewing Company of Golden, Colorado. Coors held a large share of the southwest beer market. In the early 1950s, Coors offered dealers three kegs of beer for the price of two. A-1 simply could not match that offer. As a result, numerous draft beer accounts were lost to Coors, contributing further to declining sales by Arizona. Coors practice was later prohibited by federal regulators, but the damage to Arizona Brewing had already been done. Despite declining profits and other problems, A-1's capacity had grown to over 250,000 barrels per year by 1955. Distribution now spread into New Mexico, Nevada, El Paso, Texas, southern Colorado, southern California, and Arizona. The brewery employed 150 people with an annual payroll of about $800,000. The state received over $200,000 in luxury taxes from the sales of A-1 Beer during fiscal year 1954. In the same period, the company paid the Federal Government over $2,000,000 in taxes. The brewery spent approximately $3,560,000 annually for materials, supplies, and services. Wherever possible, the brewery would purchase those items locally. A-1 would continue to remain the product of choice by most Arizonans. The majority of the population never sensed that the brewery was slowly loosing profits. The ever changing brewing industry would force A-1 to look for new ways to market their product. In an effort to possibly boost sales, the Arizona Brewing Company hired a new advertising company to market their products and direct their sales. Erwin Wasey and Company, Ltd. of Los Angeles took over the advertising of A-1 beginning January 1, 1955. The new agency's program was put into effect in early spring, incorporating a "Which One? A-1!" theme. A complete revamping of the A-1 label would soon follow. However, a curve ball was thrown into A-1's advertising campaign. Sometime around 1957, Anheuser-Busch threatened a lawsuit over the eagle used in A-1's logo since 1942. The giant brewer charged that the eagle was too similar to the one associated with Anheuser-Busch. Many local drinkers referred to A-1 as "Arizona Bud" at that time. The A-1 brewery could not afford the legal expense of a court battle, so the issue was settled quietly by discontinuing use of the eagle in their packaging altogether. In January 1958, the eagle was replaced by a knight on horseback holding a banner with the name "Lancers". A-1 Ale, a fairly new brand by the Arizona Brewing Company, first used the knight on horseback on its label when it was introduced in 1955. Introduction of the new label would spur a major advertising campaign which also promoted a new water purification system installed at the brewery. The brewery had its own well which was completed in the late 1940s. Now the brewery would be able to control the water used for brewing by a double de-ionization method creating uniform water with the correct balance of all desired elements. The new ad campaign would publicize A-1 as a beer "Brewed with Crystal Pure Water". The ads featured outdoor scenes such as Mt. Lemmon near Tucson and the San Francisco Peaks near Flagstaff and was used on all the company's packaging. Phoenix was the fastest growing city in the nation in the fifties. By 1960, it was the largest city in the southwest with a population of 439,170 people. It has been said that in 1959 alone, there was more construction in Phoenix than in all the years from 1914 to 1946 combined. The Arizona Brewing Company had to work hard to gain new customers who had loyalties to others brands. A fresh approach was needed to spur sales. Numerous changes would occur to the Arizona Brewing Company at the start of the new decade. In November of 1959, A-1 introduced a new bronze label with a sun, saddle, deer, cactus, and a familiar theme, "The Western Way to Say Welcome", on its packaging. A-1 also introduced a new container from the Owens Illinois Glass Company called "Glass Cans". The brewery was one of the first brewers to use the new style bottles and labeled them the "Little Brown Jug". The new label was a drastic change in comparison to previous advertising efforts by the brewery. A number of personnel changes were also made at the brewery. The early 1960s marked nearly twenty years since the introduction of A-1. Many long time employees were reaching retirement age and ready to move on. Lanser, Sr. was not quite ready to retire, but would give up his position as president of the company. At the annual meeting on January 20, 1961, he was elevated to chairman of the board and Herb Lindner was named new president. Lindner was the most logical choice for the position. J. F. Lanser Jr. became vice president. By mid 1962, Herb Lindner was well settled into his position as president. On June 18, he announced that the brewery wanted a new advertising agency, preferably a local one, "to show that we are proud to be 'Arizona-grown', to gain closer client-agency relationship geographically, and to expand our interest in the economy of our home state through increased advertising activity in the southwest." In July, Curran-Morton Advertising Company of Phoenix was awarded the account. The agency immediately began working on a new ad campaign. On September 29, 1962, a new beer was introduced under the name, Lancers A-1. Herb Lindner believed that A-l had reached a superior stage and a new identification was in order. In addition, many other companies were causing confusion by using the A-l name. The new beer would be lighter in flavor and different from the former A-1. The brewery expected to produce 447,000 barrels of beer by 1963. The company also introduced the Lancers-Oberheit Products Division and Specialty Brands Division in late 1962. These two divisions would be operated separately from each other, including separate selling and delivery policies. They would present a number of new brands and re-introduce some old ones. Oberheit was a new product aimed at the premium beer market. It was unique among the brands brewed by the Arizona Brewing Company because it was available only in kegs. First introduced in early 1963, it was touted as a fine quality European-type draft with old world flavor and body. The beer was targeted specifically to compete in the premium beer market. However, it never had a chance to due to its high price, lack of advertising, and the fact that it was sold only in Phoenix. Van Lauter Beer would be the launching pad for the Specialty Brands Division's new marketing campaign. The division would also market Ruser, Argonaut, Snowcrest, Harlequin, and Einbock, in addition to Dutch Treat and Elder Bran, two older brands re-introduced by the company. Veteran Arizona Brewing Company salesman Paul Crampton was named head of the division. In 1963 two longtime executives and friends of the company passed away. 'Pop' Lindner was 83 years old and had retired two years before his passing on February 6. He had been brewmaster from 1937 until 1950, then plant superintendent until 1961. Many credit him for keeping the brewery running through prosperity and tough times. Lanser passed away after a heart attack on December 8. He was the principal stock holder and credited with the expansion of the company from a small plant to regional prominence. To honor Lanser's service to the company, Lancers Beer was renamed J.F. Lanser's Beer. The announcement was made by J.F. Lanser Jr., vice president of the Arizona Brewing Company in July 1964. The change to the new brand was completed by September 1. Joe Lanser and 'Pop' Lindner were very quality conscious. They were well respected and everyone seemed to work a little bit harder in there presence. With their absence, quality control at the brewery took a slight dip. Some believe that a decision was made to increase the water content in the beer in order to increase production. It was basically an effort to stretch company dollars. Using less labor and less materials, the company would make larger profit, thus money would he saved. It could have simply been an oversight, or possibly the belief that most customers would not notice. Customers did notice! The move had the opposite affect and sales started to slip even further. By the early 1960s, the idea of chain breweries was developing at a rapid pace. The majority of brewers believed that expansion was necessary to remain competitive. For many companies, it was a struggle for survival. One way to expand, short of building new facilities, was to buy out or merge smaller breweries. This phenomenon added to the demise of many smaller regional breweries throughout the United States. Only 140 independent breweries were left in the country in 1961. The Arizona Brewing Company was struggling, sales were lagging, and it was only getting tougher to turn things around. It was obvious that the brewery was not in as good of shape as it used to be. Something had to be done to remain in business. Workers noticed a lot of movement at the head offices, unfamiliar faces were seen, and rumors began to emerge. The rumors were true. On October 8, 1964, it was announced that the Arizona Brewing Company would be purchased by the Carling Brewing Company, Cleveland, Ohio, a subsidiary of Canadian Breweries Ltd. of Canada. The agreement was reported in a joint statement by Henry E. Russell, Carling president, and Herb Lindner, president of the A-1 brewery. The announcement came as a shock to many long-time workers. Their brewery was the victim of a buyout. It is unclear whether or not the A-1 brewery actually was up for sale at the time or not. Yet, the possibility that Carling made a good enough offer to purchase the company which in turn led to its sale was not far from reality. Carling was eager to expand westward. The purchase would make the Phoenix plant Carling's ninth brewery.